She can really sing! He is a great manager! She is an amazing hairdresser! They won the Olympics this year! That woman can preach! It is amazing to see what is accomplished when we discover, develop, and use our skills and talents at full capacity. God is the one who determines how many skills and which talents you get to have. It’s His prerogative! He made you unique with a set of skills and talents especially for you. I’m telling you, God has really good intentions in mind. Giving you these skills and talents was part of making sure His plan to prosper you works out and that you have what is needed to fulfill your purpose. Can you believe some people think they actually don’t have any talents at all? No, really! There are people out there who think that. I assure you it is not true. Skills and talents are words that describe you. Although many people have some of the same skills or talents you have, these will never be used exactly in the same way and they will not accomplish the same exact purpose. 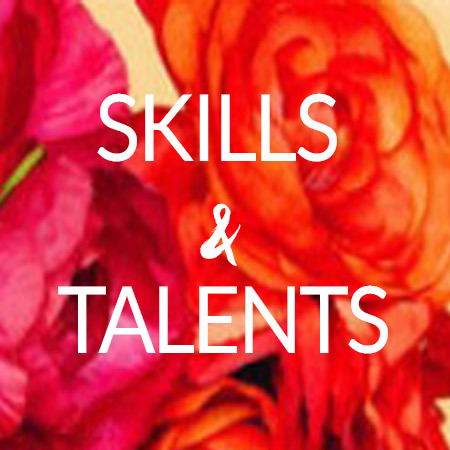 You and I have skills and talents. Yeah, what does that mean? According to Webster’s dictionary, being skillful and talented means to possess or display a skill, to be an expert, like a skillful chef accomplished with a skill. It means you are proficient in something: able, brilliant or capable. As mighty women, we should know that we have a common enemy who wants us to think we don’t have any talents or that they are not worth pursuing. He tries very hard to mess up our lives so we don’t discover them. If we do discover them, he will try to terminate any opportunity so we never get to use them, it’s a real battle we fight. Why do you have to develop your gifts, abilities, skills and talents? Only you will give an account to God for what you did with them. If you use them, even more will be given; if you don’t, even the ones you have will be taken away. That would not be good, since by using our talents they grow. See Matthew 25:29. God will accomplish His purpose and assignments through you. Only you, in your unique way, can accomplish what God has called you to do. Be ready, opportunities are coming your way! Can you see the connection? You purpose is part of God's purpose. Can you be trusted? Will you go?